Stalactites form when a drop of liquid limestone is precipitated in the shape of a ring upon contact with the ceiling. Ring falls on ring and, in this way, a shape similar to a hollow macaroni is formed whose diameter is that of the drop of water. 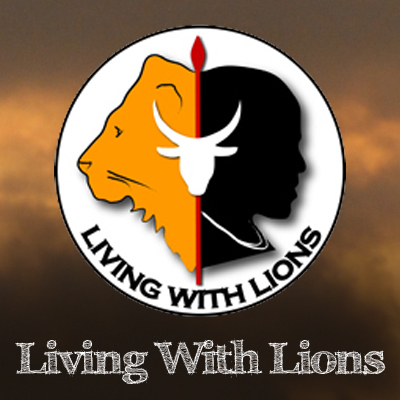 Back in 1987, while living in Israel and working for the George S. Wise institute of Life Science at the University of Tel Aviv, I was invited to spend a weekend of adventure at a Kibbutz in central Israel. My host, the kipper of the crocodile’s farm (story for another post) had the weekend very well organized. The highlight would be visiting caves where Jews used to hide from the Romans to study the Torah. I said, cool, let’s do it! of course at the time, my understanding of a cave was a big opening on a hill where you could walk in as a too-legged human being. What I found instead was a barely noticeable “hole” in the ground, where I had to squeeze myself through, and a long tunnel full of bats where I had to drag myself in order to reach the main chamber. Needless to say I had a panic attack! And no, it wasn’t the bats. It was the impossible narrowness of the space and the fact that I couldn’t figure out how I was going to get out of there. The ingeniousness of these hiding places was so amazing that it didn’t take me long to recover from the first shock. That day we visited four different caves in the same region, each one with its own special quality and as you can see I survived the adventure to tell the story. That was a glorious day, not only I faced my fears head-on but actually I became addicted to cave exploring. 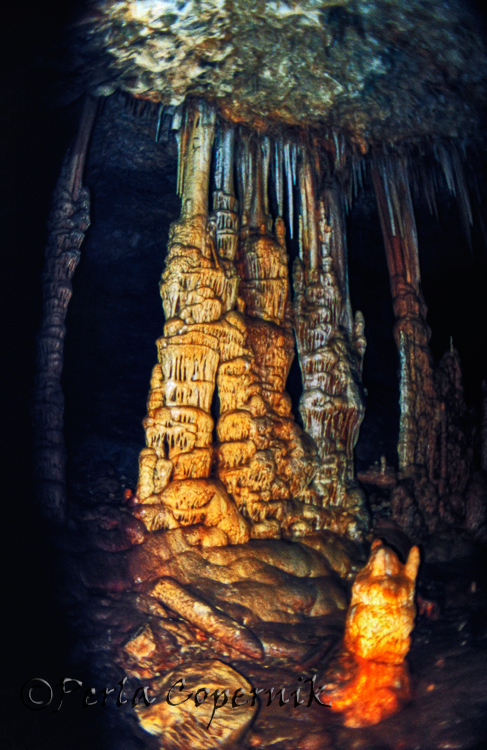 When the rate of dripping is faster than the rate of diffusion of carbon dioxide, as the drops fall to the cave floor the rest of the carbon dioxide will be diffused and the limestone will crystallize into a stalagmite. I did visit several other caves that year in many shapes and forms including the “traditional” ones, but I could not leave Israel without visiting a very special cave, one carved by nature and for nature. I’m talking about the Soreq Cave. Compared to other caves in the world, Soreq cave is tiny -5,000 square meters or 53,820 square feet. 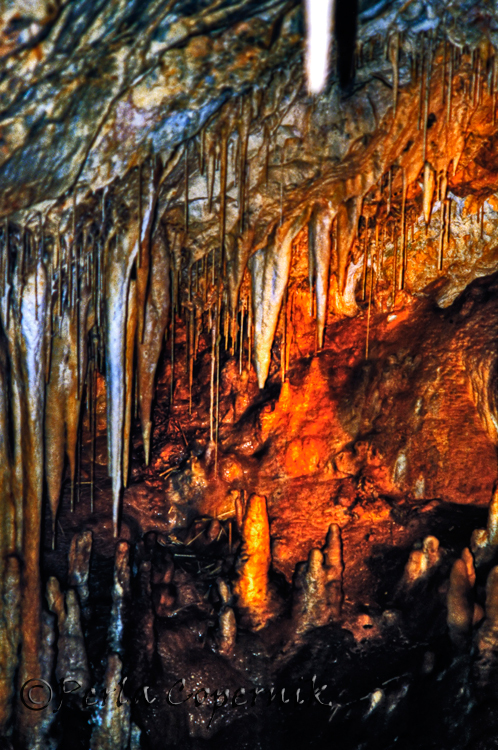 Yet it is one of the richest caves in the world in terms of variety of stalactites and stalagmites. The cave was discovered in May 1968, when an explosion opened a crack into a magical and fantastic world hidden beneath the ground in the middle of the Judean Hills. According to geologists, the Soreq cave was formed around 25 million-years ago, when the mountainous range of the Judean Hills rose up above the surface of the water. The layers of limestone and dolomite rock were displaced and folded with time, forming cracks which allowed water to enter and dissolve some of the rock. While seeping through the cracks and flowing through the soil this water absorbed increasing amounts of carbon dioxide from the roots of the plants and the surrounding decay. 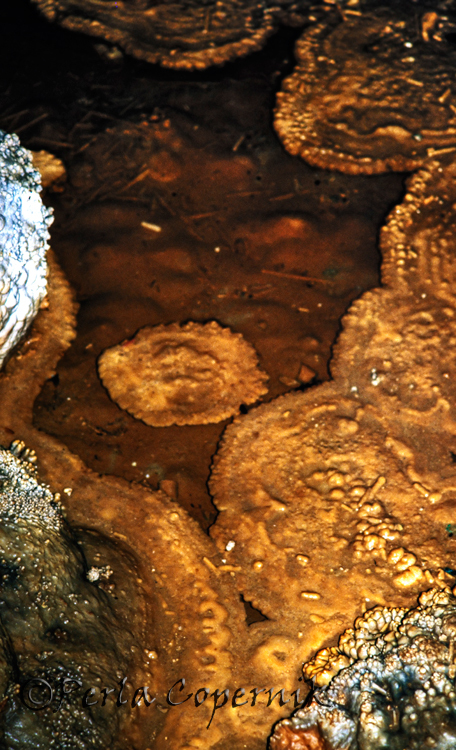 This process that turns the water acidic is called “Karst” and helped with the cave expansion process. Citadel-shaped column. Occasionally several of these columns connect into curtains and screens which dived the cave into a number of secondary chambers. The next stage in the history of the cave began with the retreat of the sea and the lowering of the ground water level. The dissolution of rock stopped and the process was reversed. Drops of water saturated with limestone solution reached the ceiling of the cave the carbon dioxide escaped and the remaining limestone crystallized, creating the huge diversity of stalactites we see today. Is that the face of a man? 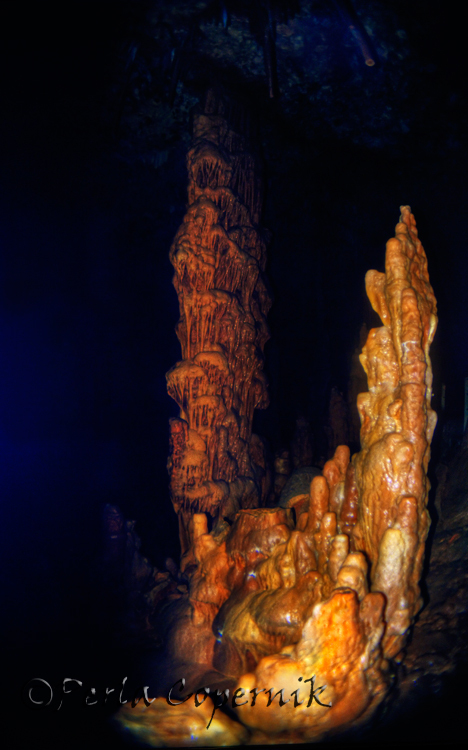 Some of the stalagmites and stalactites meet and fuse into one big column. Sometimes we can detect the meeting point, but sometimes the connection is so complete that detection is impossible. 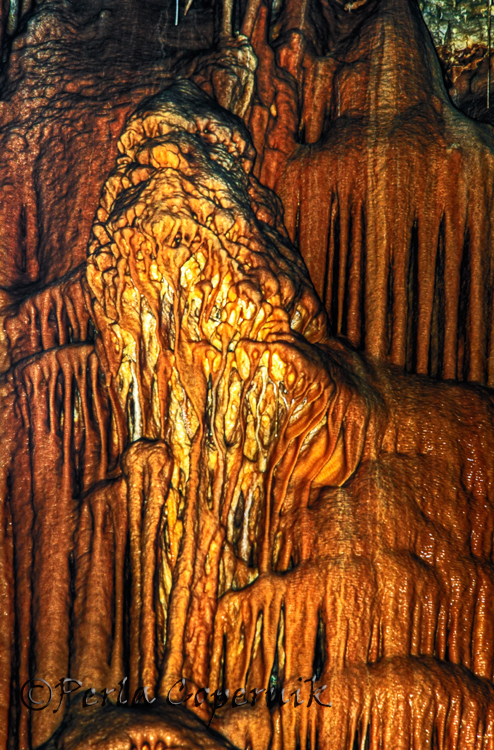 When the rate of dripping is faster than the rate of diffusion of carbon dioxide the drops fall to the cave floor releasing the rest of the carbon dioxide and the limestone crystallizes into a stalagmite. Many of these will merge with the stalactites forming this huge and magnificent sculptures. Wedding cake-shaped stalagmite. 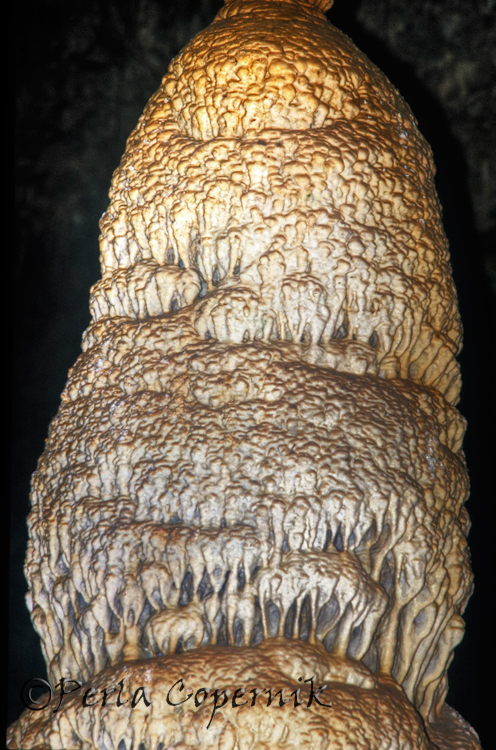 The stalactites are usually very thin and smooth but the stalagmites display a great variety of shapes. “Wedding cakes”, “citadels” or “city of pagodas” are some of the most common shapes. In this case the big challenge was not visiting the cave, which is already prepared to receive tourists but getting permission to take pictures inside it. Doing some research I found out that on Friday mornings they would allow reporters and photojournalists to visit the cave and photograph at will. So there I was one Friday morning with a couple of friends and two bags filled with photo equipment, three quarters of which I knew I was not going use, but with that amount of equipment on tow who could dispute that I wasn’t a professional photojournalist then? Perla: you are getting better and better, this article is impressive!